The subject property, commonly known as “the Palisadium,” consists of two adjacent tax lots located at 700 Palisadium Drive in the Borough of Cliffside Park (the “Borough”), Bergen County, New Jersey. The improvement on Lot 7 consists of 74,668 square feet, containing a banquet hall on the upper level and a fitness center and health spa on the lower level. The various banquet rooms are situated so as to maximize the views of the Manhattan skyline, including the Skyline Ballroom, which features “a panoramic view of the Hudson River and Manhattan skyline, from the George Washington Bridge to midtown.” The improvement on Lot 9 consists of a four-story parking deck containing 146,880 square feet and parking for 630 cars. The New Jersey Tax Court rejected the Borough’s application of the cost approach to value the subject property. 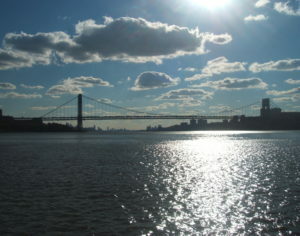 “Neither the location of the subject property, with its admittedly superior views of the Hudson River and New York City skyline, nor the unusual combination of uses, qualify it as a ‘special-purpose’ property for which the use of the cost approach to valuation is appropriate,” the court held. [T]he mere physical location of the structure does not place it in a classification of “special purpose.” While it is unquestionable that commanding views of the Manhattan skyline enjoyed by the subject property require special consideration, these views are not exclusive to the subject property and are not truly unique. Despite rejecting the Borough’s approach, the Tax Court ultimately upheld the assessment. It concluded that neither party provided the court with competent evidence of value sufficient to overcome the assessments. While it found that the plaintiffs’ expert’s use of a hybrid approach to valuation was appropriate, it determined that the valuation was not credible because the expert failed to provide adequate objective evidence to support adjustments made. For more information about the New Jersey Tax Court’s decision or the legal issues involved, we encourage you to contact a member of Scarinci Hollenbeck’s Government Law Group.